Posted January 19, 2018 in Apartheid, Apartheid Wall, BDS, Human Rights, Podcast, Press releases, Refugees, Right of Return, The Wall, West Bank. 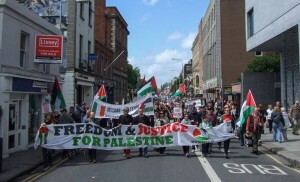 Posted June 19, 2017 in Academic Boycott, Administrative Detention, Apartheid, Apartheid Wall, Arms Embargo, BDS, Boycott, Campaigns, Child deaths, Child Prisoners, Cultural Boycott, Day of Action, Demonstration, Divestment, Ethnic Cleansing, Event, Event Report, Gaza, History, Human Rights, Impunity, Irish Government, Israeli Embassy, Jerusalem, Multimedia, Nakba, National Rights, Palestinian Citizens of Israel, Palestinian Culture, Photos, Political Rights, Press releases, Protest, Right of Return, Sanctions, Siege of Gaza, Sporting Boycott, Statements, Trade Unions, Uncategorized, Video, War Crimes, West Bank. 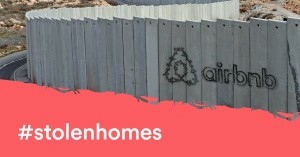 1 Minute for Palestine: Tell AirBnb to stop profiting from Stolen Homes built illegally on Palestinian land! 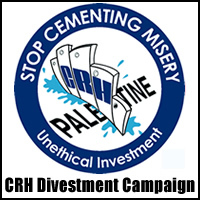 Posted May 31, 2016 in Action Item, Apartheid, Apartheid Wall, BDS, Campaigns, Email Campaign, Ethnic Cleansing, Home Demolitions, Human Rights, National Rights, Political Rights, Press releases, Settlements, War Crimes, West Bank. Posted January 9, 2016 in Apartheid, Apartheid Wall, BDS, CRH, Human Rights, National Rights, Political Rights, Press releases, Stop the Wall, The Wall, War Crimes, West Bank. Posted October 22, 2014 in Action Item, Apartheid, Apartheid Wall, BDS, Campaigns, CRH, Divestment, Email Campaign, Gaza, Human Rights, Petition, Press releases, The Wall, War Crimes, West Bank. 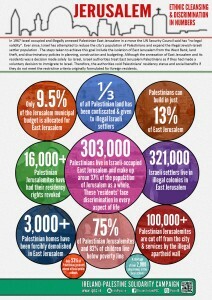 Our latest infographic on East Jerusalem, looking at Israel’s policies of ethnic cleansing and discrimination against Palestinian Jerusalemites in numbers. Sources for the figures are The PLO Negotiations Affairs Department, the Israeli Committee Against House Demolitions, Applied Research Institution of Jerusalem, the Association for Civil Rights in Israel (ACRI), B’Tselem – The Israeli Information Center for Human Rights, and +972 Magazine. Posted June 7, 2014 in Apartheid, Apartheid Wall, Home Demolitions, Human Rights, Infographic, Jerusalem, National Rights, Political Rights, Press releases, Refugees, Settlements, UN, War Crimes, West Bank. 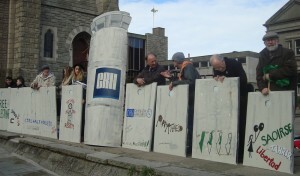 Posted May 7, 2014 in Apartheid, Apartheid Wall, BDS, CRH, Divestment, Ethnic Cleansing, Event Report, Human Rights, National Rights, Political Rights, Press releases, Protest, Settlements, The Wall, War Crimes, West Bank. 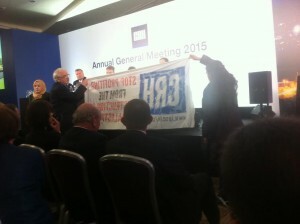 Posted January 30, 2014 in Academic Boycott, Action Item, Apartheid, Apartheid Wall, Arms Embargo, BDS, Bedouin, Boycott, Child Prisoners, CRH, Divestment, Economic Boycott, EU, EU Guidelines, Euro Med, Gaza, Home Demolitions, Horizon 2020, Human Rights, Irish Government, Nakba, National Rights, Palestinian Citizens of Israel, Political Rights, Press releases, Prisoners, Refugees, Right of Return, Sanctions, Settlements, Siege of Gaza, The Wall, UN, United Nations, War Crimes, West Bank. Posted January 23, 2014 in Academic Boycott, Analysis, Apartheid, Apartheid Wall, BDS, Boycott, Campaigns, Cultural Boycott, Divestment, Human Rights, National Rights, PACBI, Political Rights, Press releases, Right of Return, Sanctions, War Crimes.